Local vendors set up booths with a wide variety of dried goods, fresh produce, honey, tamales and kettle corn in Mullin Town Square on Tuesday afternoon. They will continue to come every two weeks on Tuesdays from 11 a.m. to 2 p.m., for the next five years, Coordinator for Center for Sustainability Emily Mead said. Mead said they, as the Center for Sustainability, want people to cook more and broaden their horizons to a variety of new and healthy foods. They looked for local vendors that prioritized organic foods, because they did not want students to be eating chemicals. Mead said she found the vendors from scouting out other markets and by word of mouth. 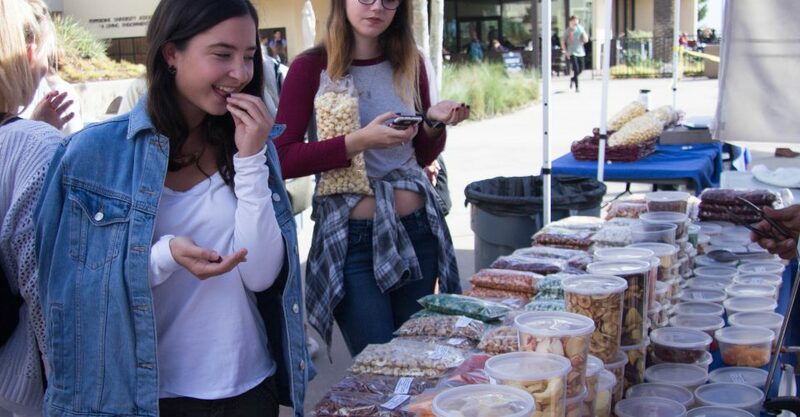 Mary Jones, a local vendor who works for Apricot Lane Farms in Moorpark, said they were approached because the university was looking to introduce the concept of bio-dynamic, nutrient density and intense flavor in the food they grow. She continued to say organics focus on what is not done to their produce and garden dynamics focus on putting nutrients back into the soil. Jones said she hopes students see that their food sources are not limited to grocery stores. “Unless we’re having these personal conversations with people about how we grow our product and how food is being produced, it’s really easy to live in ignorance and this is an opportunity to educate yourselves and make informed decisions,” Jones said. Rick Hernandez said he has been making kettle corn for seven years, going to some local farmers markets, but mostly going to private parties. He compared his experience on a college campus to his previous experiences. Hernandez said he looks forward to coming back every other week to serve the students. In addition to the health benefits of locally produced products, sophomore Morris Chen said there is a greater sense of community with local producers when they know the customers well. “If they continue to do this, it will be beneficial in forming relationships with students and knowing where things come from,” Chen said.